For the century following the first scientific descriptions of dinosaurs, the ancient creatures were viewed, at best, as overgrown lizards. At worst, they were cantankerous monsters, sloshing through prehistoric swamps. For every Leaping Laelaps, there were a dozen bloated tyrannosaurs. The “Dinosaur Renaissance” began in the 1960s, when paleontologists reconsidered dinosaurs. This paradigm shift was based largely on the discovery of agile predators like Deinonychus, along with a re-imagining of the most famous dinosaurs. 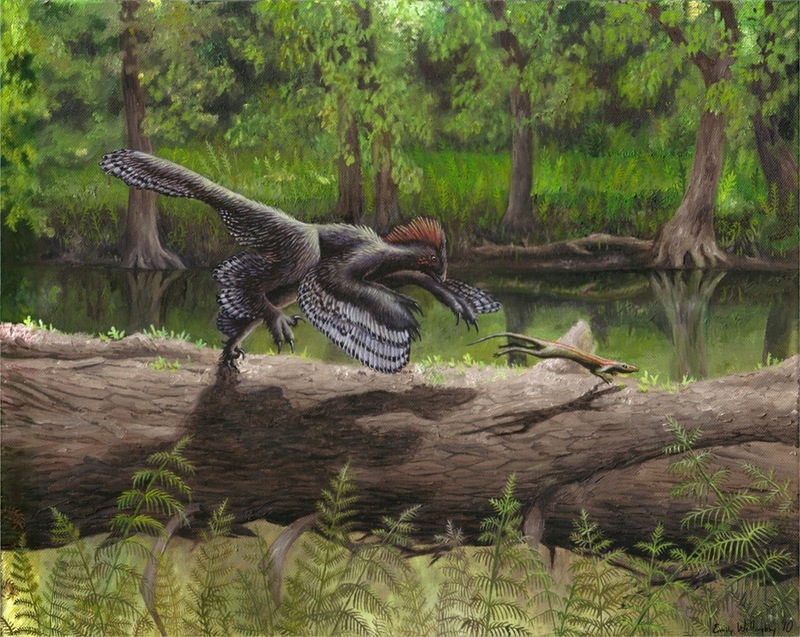 Closer examination of nests, anatomy, bone structure, growth rates, and other biological questions led to the inescapable conclusion that dinosaurs were the ancestors of modern birds. The Renaissance began in lecture halls, museum storerooms, and scientific journals. Its fundamental ideas were tantalizing to scientists and the public alike, but it took decades of hotly contested debates over the fossil record before nearly every scientist was won over by the evidence. 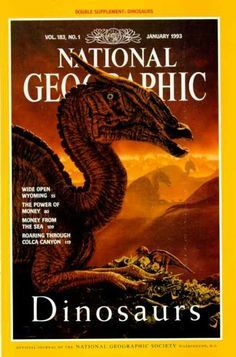 The need for increased cable television programming and the market for dinosaur-themed home movies in the late 1980s and early 1990s prompted a cascade of documentaries and special features. The Renaissance was hitting the mainstream, with dino-mania at a fever pitch. Tours by Dinamation International and the Kokoro company brought animatronic dinosaurs to audiences around the world. 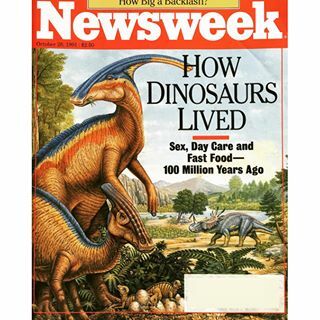 National Geographic, Newsweek, and Time placed dinosaurs on their front covers. The upswell of interest was finally pushed over the top in 1993 when Jurassic Park roared into cinemas. The film did more to showcase the new scientific ideas about dinosaurs than all the previous educational efforts combined. 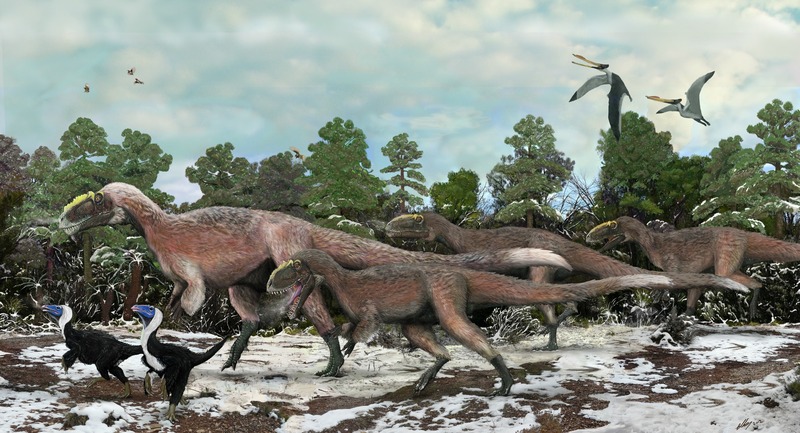 Dinosaurs–despite the inaccuracies and exaggerations of the film–were seen as living animals more than evolutionary dead-ends. As the 90s progressed, a seemingly non-ending cavalcade of feathered dinosaur fossils began fluttering out of China. Researchers began to ask, not just biological questions of size or strength, but behavioral questions. What color were dinosaurs? How did they court each other? What were their everyday lives like? These seemingly unknowable topics were off-limits in previous eras of dinosaur study, treated mostly in speculation and tentative hypothesis. But thanks to more careful preparation of fossils, the benefit of rich new fossil beds around the world, the use of cutting edge technology, and collaborations with scientists in other fields, dinosaur paleontology has moved into a “Dinosaur Enlightenment.” The term seems to have been coined by paleontologist Thomas Holtz and was popularized by many in the dinophile community, including science writer Brian Switek. As the current “golden age” of dinosaur paleontology continues, we learn more each day about dinosaurs that burrow, display, and glide. We examine paleo-pathologies that tell us about dinosaur injury and disease, and trace fossils that give us clues about behavior and biology. We can infer the colors of dinosaur feathers, the temperature of their bodies, and how their bodies changed as they aged. The Dinosaur Enlightenment continues, with each discovery proving to be more beguiling than the last. How fortunate we are to be alive during this outburst of Mesozoic understanding–the true scope and impact of which will only be comprehensible with the passage of time. Share your favorite specimens, memories, and photos from the Dinosaur Renaissance on Facebook and Twitter with the hashtag: #TDIDinos !